Why are China instant noodle sales going off the boil? Easy to make and cheap to buy, instant noodles have long been China's ultimate convenience food. Be it a snack for students, a meal on the train, or just the go-to choice for hungry workers, more than 46.2 billion packets were sold in China and Hong Kong in 2013. But by 2016 those sales had tumbled to 38.5 billion packets, according to the World Instant Noodle Association. And let's face it, they would know. That's a drop of almost 17%. Given most other instant noodle markets have remained fairly steady over the past few years (with the notable exception of India where the recall of Maggi noodles led to a sharp drop in 2015) - it is an unusual pattern. So what's going on? Well here are some theories - which suggest instant noodles could be, in many ways, a great indicator of how China is changing. How big is gaming's racial diversity problem? Quiz Of The Year - what can you remember of 2017? The recipe for instant noodles is fairly straight forward: Just add boiling water, a sachet of sauce, and some small packets of dehydrated vegetables and meat. As appetising as that sounds, one factor in the slump could well be that some Chinese consumers are upping their expectations in the dining department. "The decline of instant noodle sales shows a shift in China's consumption patterns," said Zhao Ping of the Academy of China Council for the Promotion of International Trade," he told the China Daily. "Consumers are more interested in life quality than just filling their bellies these days." 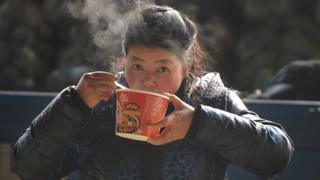 One of the big consumers of instant noodles - the theory goes - are migrant workers. And when you think about it, it makes sense. They are away from home, often living in cramped conditions with limited cooking facilities, and keen to save as much money as they can to send back to their families. Until 2014 the number of rural Chinese who had moved to cities had been on the rise. But that trend has now reversed for two consecutive years (and is expected to keep doing so when the 2017 data comes out). Last year 1.7 million fewer migrant workers lived in cities than in 2015, which quite plausibly could be eating into noodle sales. Travelling in China 20 years ago, I filled my stomach (and time) by eating pot after pot of instant noodles during cross-country train journeys, which sometimes lasted three days or more. More than once, the combination of a carriage jolting and general clumsiness sent splashes of the hot spicy noodle liquid into my eye. Which hurt. But Chinese trains and stations have improved. Journeys are quicker, and the range of food options are far more international - meaning noodle sales on the railways have fallen. And then there is the boom in aviation as middle class Chinese people spend billions flying on domestic and international holidays instead of using trains. Almost 500 million domestic and international journeys were taken in 2016, according to the Civil Aviation Administration of China. But given a third of all domestic flights were delayed last year (according to industry body IATA), that is a lot of passengers waiting around, so maybe airports could be a good place to boost noodle sales. About 730 million people in China now have access to the internet according to government figures. And about 95% of those are using smartphones to connect. And apps that offer food delivery to your home, office or wherever you happen to be are a real boom industry. Their menus are undoubtedly more expensive than a pot of instant noodles. But these meals can still be inexpensive. And arguably more tasty. Almost three times as many packets were sold in 2016 than in the nearest rival Indonesia. In fact China's total was roughly the equivalent of Indonesia, Japan, Vietnam, India, the US, South Korea and the Philippines combined. And that means global noodle manufacturers are unlikely to turn away from the Chinese market. Japan's instant noodle business Nissin Foods, for example, is planning a stock market flotation in Hong Kong. It hopes to raise about $145m (£108m). It is rare for a Japanese firm to list in Hong Kong, but Nissin is talking up its prospects in China, where it is already the fifth biggest brand. "Some consumers stopped consuming instant noodles, but most consumers want to increase the quality (of food they consume)," chief executive Kiyotaka Ando told CNBC last week. "We can supply high-quality products so we have more possibility to develop our business."